Experience a new approach to laundry with the Ultima Washer Dryer (FDD 9640 P UK) in graphite delivering the latest technology in stain removal and sensor drying while caring for your clothes. Remove 20 of the most stubborn everyday stains in one wash without pre-soaking. Through a process of cleverly managing detergent, saturation, temperature and drum rotations, Hotpoint's Ultima Washer Dryer frees you from pre-treatments and expensive chemicals. Understanding that you sometimes need to wash in a hurry, the Ready to Wear function washes and dries your clothes or linens in just 45 minutes with the same great results as a longer cycle. Tackling everything daily life can bring, for those who suffer from sensitivity to pollen, dust and pet dander, the Ultima Washer Dryer includes an Anti-Allergy wash and rinse cycle - so effective it removes 99.9% of major allergens and has been awarded the Allergy UK Seal of Approval. 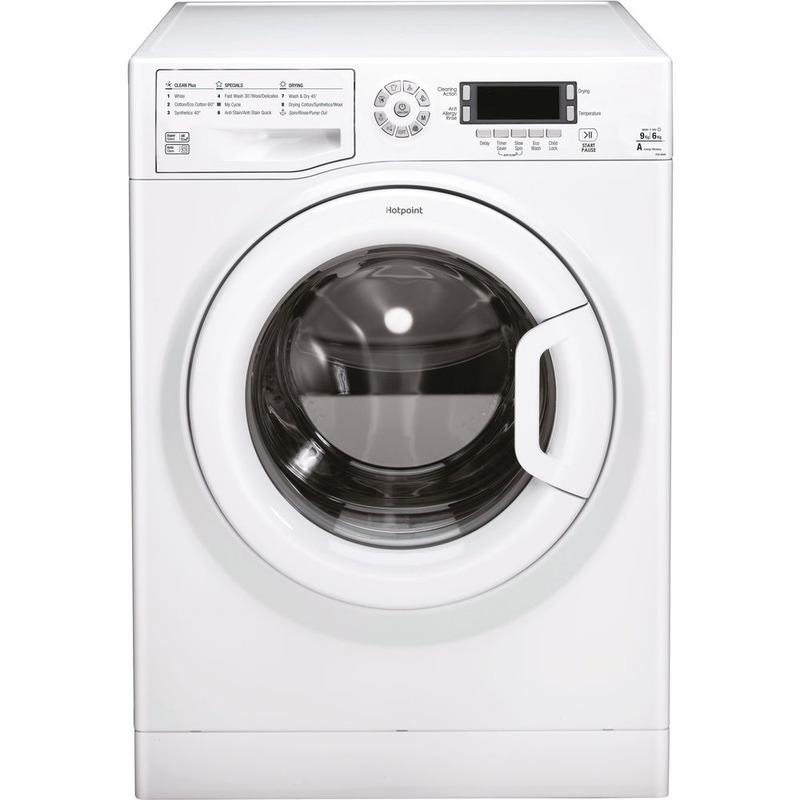 Capable of tackling every challenge your household has to offer, with multiple programs including Eco cycles and dedicated a delicate wash, the Ultima Washer Dryer is designed for every eventuality whether it's renewing brightness in school shirts, lifting stubborn marks out of jeans or quickly washing the gym kit ready for another work-out. Looking for efficient time management too? Load the drum then use the Delay Start setting to choose a time up to 24 hours later for the cycle to start. Ideal if you want the wash and dry to finish as your come home from work. Keeping efficiency in mind beyond the wash cycle, Set and Forget Sensor Drying monitors the humidity in your wash, using only the necessary energy, stopping tumble drying once your clothes are dry which helps keep clothes soft and fibres intact. Taking extra special care of knits, this model has also been awarded the prestigious Woolmark Platinum Care  a mark of quality and confidence that your favourite woollen jumper will come out just as soft and shapely as it went in. Delivering variable spin speeds of up to 1400rpm, the Super Silent Motor also prevents your laundry duties from disturbing family moments as special sound insulting panels and an advanced brushless motor reduces noise levels dramatically. With a 9kg drum, an A energy rating and digital 8cm iScreen display - the Ultima Wash Dryer (FDD 9640 P UK) puts the power at your fingertips with a machine that's ready for anything.